"The story of a man and a woman who lived happily ever after. Even though the courtship almost killed them." Two new trailers have debuted for the upcoming 30th anniversary special re-release of the romantic fairytale comedy classic The Princess Bride, directed by Rob Reiner. This open in limited release back in 1987 and didn't make that much at the box office, but it has gone to become a cult classic that fans still rave about nowadays. The story centers on Buttercup, played by Robin Wright, a former farm girl who has been chosen as the princess bride to Prince Humperdinck of Florian. But she does not love him, and still laments the death of her one true love, Westley, played by Cary Elwes. The ensemble cast includes Mandy Patinkin, Chris Sarandon, Christopher Guest, Wallace Shawn, André the Giant, Fred Savage, Peter Falk, and Billy Crystal. If you've never seen this in theaters, now is your chance this month. Enjoy. When the lovely Buttercup is kidnapped by a ghastly gang intent on fermenting an international incident they find they are pursued by the Dread Pirate Roberts who just might be Westley, her one true love. Also after everyone is nasty Prince Humperdinck to whom Buttercup is now betrothed but who seems to care little for her continued survival. The stage is set for swordfights, monsters, and tortures - but will Grandpa be allowed to finish telling the story with all these kissy bits? 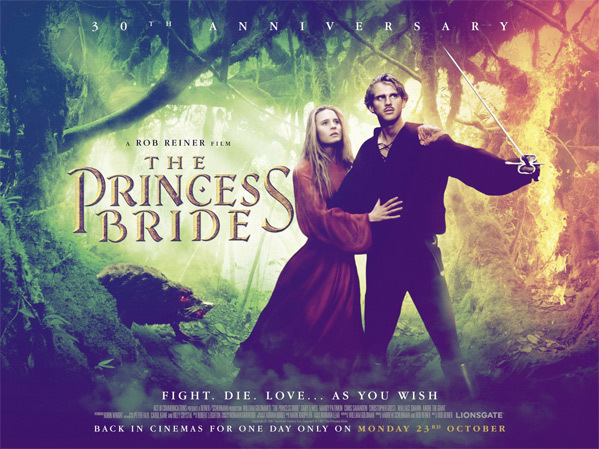 The Princess Bride was directed by Rob Reiner, and was first released in October of 1987. It opened first in limited theaters, before expanding wider eventually. Fathom Events will handle the US re-release on Sunday, October 15th and Wednesday, October 18th, and the film will also get a special re-release event in the UK. Who's excited to revisit this?